I've used a couple of Elemis products in the past and had mixed experiences. Some I've found too harsh, some I've found to be amazing (like their Oxygenating Night Cream) but I just can't justify the price tag! 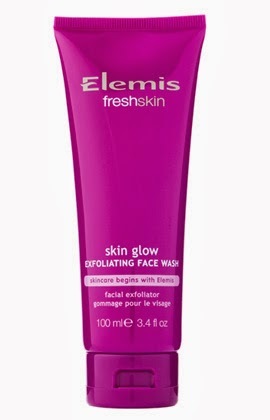 I was really excited to try out this face wash as it's been a long time since I used anything from Elemis! The Fresh Skin range from Elemis is targeted at a much younger audience than I'd usually associate with Elemis. They're designed for young skin, teens to 20s and priced really reasonable for that age range. If you're a teens to twenties reader who wants to experience a more high end brand like Elemis this is a great range to jump in on. I'm really loving the look of the kits they have put together too! Check out this great kit over on Feel Unique that's just £15 and contains the Skin Glow face wash! The Skin Glow Exfoliating Face Wash is a deep pore cleansing face wash containing cherry powder and jojoba beads to gently polish and refine skin texture. It also contains mandarin and aniseed to soften and condition the skin, leaving skin looking clearer, bright and radiant. What I love about this is that it contains no parabens, sls, sles, dea, mineral oils, artifical colours and silicones. It's free from all those nasties that we don't want to be slathering over skin of any age, especially young skin! I really wish this had been around when I was in my teens, it would have been so much kinder to my young and innocent skin - let' be honest, I made some epic product fails back then! With all those fruity ingredients I was really expecting the scent to be nice and fruit too but...maybe it's just my nose, but this smells like bubbles. Seriously. Remember those brightly coloured pots of bubbles you used to buy at the shop for £1? They had that really distinct smell, almost like washing up liquid and this face wash has exactly the same scent! I was instantly transported back to my childhood. I didn't find it as unpleasant as it sounds though, especially as it brought back some awesome memories. It was a really unusual scent, very soapy! The wash itself is lovely. When they say gentle, they mean it, they've really kept the younger audience in mind with this. I also think it could be great for those with sensitive skin. The beads are quite large compared with with say, St Ives Apricot Scrub, and very few and far between. You can feel them on your skin, but they're not overwhelming or harsh at all. I have oily skin so harsher scrubs with fine beads can really dry my skin out, but when using the Skin Glow Exfoliator my skin didn't dry out at all, it felt really soft and nourished. After use my skin felt really clean and looked very matte. Scrubs can usually leave my face looking too polished, like a spit-shined bowling ball but I really haven't experienced that at all with this scrub. Though my 26, almost 27 year old skin is well out of this products target range I would use this again, especially when I want something a little gentler on my skin. My skin felt so soft! My pores didn't look much clearer but lately they haven't been too bad so I doubt there was much dirt and grime there to clear out! This is a great, gentle exfoliator, especially if you're looking for a more budget friendly introduction to a higher end brand! I'd love to try out some more products in this line even if I'm almost 10 years older than it's target audience! Have you tried anything form the Fresh Skin line by Elemis? Note: major camera/upload issues this evening so pictures will hopefully be added to this post by the weekend! Sorry!